Astronaut Chris Cassidy points to his "lucky charm," a small toy astronaut figure, on the International Space Station. An astronaut working onboard the International Space Station (ISS) has revealed his "lucky charm" — a miniature toy astronaut figurine — in a video recently sent down to Earth. "I was going through personal things [that] I have flown for people and came across my own personal item I'd like to share with everybody," NASA astronaut and Expedition 36 flight engineer Chris Cassidy said in the video, which was released online Wednesday (Sept. 4). "This little astronaut guy has seen better days but he has special meaning." 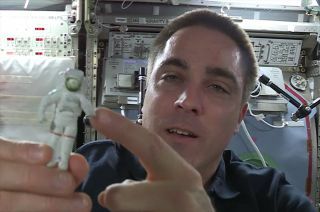 In the video, Cassidy holds up and lets float the 3-inch-tall (7.6 centimeters) toy, which was sculpted to appear to be wearing the same type of spacesuit that Cassidy has worn on spacewalks outside the space station. "Before I was selected as an astronaut, I knew I wanted to become one and I somehow came across this guy in a toy set for my kids, or something like that," Cassidy recalled. Flying to the space station is just the latest adventure for the plastic figure, Cassidy said. As a Navy SEAL, Cassidy was deployed on four 6-month missions, including being sent to Afghanistan two weeks after the Sept. 11, 2001, terrorist attacks. "I took him with me to Afghanistan every time and he was always in my pocket on every mission that I did," Cassidy said from aboard the space station. Cassidy was chosen to join NASA's ranks in 2004 with the agency's 19th group of astronaut candidates. "When I was selected to become an astronaut, I felt like [the figurine] was a good luck charm, so he has been with me every step of the way," Cassidy said. "He often flies in T-38 [training jets] with me and various other places. I just leave him in the pocket of my flight suit and I often kind of forget that he is there." "It [also] flew on the space shuttle," Cassidy, who made his first visit to the space station on space shuttle Endeavour's STS-127 mission in 2009, added. NASA astronauts are permitted to carry a small number of mementos and personal items to space, as souvenirs for family and friends, as well as remembrances of home. In addition to the astronaut figure, Cassidy also brought with him to the space station a medallion bearing the likeness of John F. Kennedy, which he said was to pay tribute to the former president's space legacy. To date, Cassidy's lucky charm has logged more than 176 days off the planet — and it still has five more days to go. Cassidy and two of his fellow crewmates are scheduled to depart the space station and return to Earth onboard a Russian Soyuz capsule on Sept. 10. "He'll be right with me on our descent in the Soyuz," Cassidy said. The "soft" landing on the steppe of Kazakhstan will be one more bump along the lucky charm's journey. "This little astronaut guy, [he's] got one broken arm, which happened in Afghanistan, but short of that he is in good shape," Cassidy said. "Got a few scratches on his visor there — I'll have to give him some training on how to control himself during spacewalks so he doesn't bump his visor."